Beginning January 21, 2019, a section of Interstate 59/20 will be closed for approximately 14 months due to bridge construction. 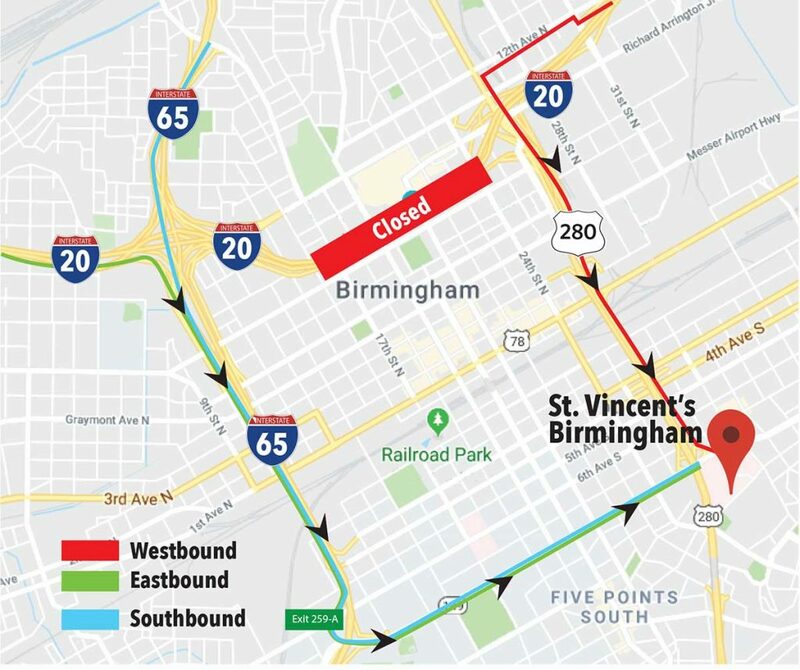 Some patients may need to take an alternate route to reach St. Vincent’s Birmingham. Eastbound I-59/20 traffic (from Tuscaloosa/Bessemer) will not be able to take I-59/20 to Red Mtn. Expressway. Instead, take I-65 South to exit 259-A (6th Ave. S.). Merge onto 6th Ave. S. Then take a left on 8th Street S. Turn left onto 8th Ave. S. and proceed 1.8 miles to St. Vincent’s. Southbound I-65 traffic (from Huntsville/Cullman) will not be able to take I-59/20 to Red Mtn. Expressway. Instead, continue on I-65 South to exit 259-A (6th Ave. S.). Merge onto 6th Ave. S. Then take a left on 8th Street S. Turn left onto 8th Ave. S. and proceed 1.8 miles to St. Vincent’s. Westbound I-59/20 traffic (from Atlanta/Gadsden) will only be impacted the weekend of January 18 and intermittently in the late evening for the ﬁrst few weeks of the project. During those times, use exit 126-B (31st Street). Exit right and take the ﬁrst left onto 12th Ave. N. Take a left onto Carraway Blvd. and proceed onto Red Mtn. Expressway. The Alabama Department of Transportation (ALDOT) will post updates throughout the construction at 5920bridge.com. Please check before traveling to the hospital. From I-459 North – Take Exit 32. Go straight through the US HWY 11 intersection onto Edwards Lake Road. At the third traffic light, turn left onto Medical Park East Drive. Go approximately 0.3 miles and Pilot Medical Drive is on the left. From I-59 North – Take Exit 134. Turn left at the bottom of the interstate ramp. At the traffic light, turn right onto US Hwy 11. Go to the second traffic light and turn left onto Medical Park East Drive. Go approximately 1.7 miles and Pilot Medical Drive will be on your right. From I-20 East – Take exit 158. Turn right onto AL-53/Martin St. N /US-231. Take your second right onto Jeanne Pruitt Dr. Take your first right onto 23rd St. N. Take your first left onto Jeanne Pruet Dr. Take your first right onto Plaza Drive and Northside Medical Associates is on your right. From 1-20 West – Take exit 158 B. Merge right onto AL-53/Martin St. N /US-231 and go approximately 0.3 miles. Take your second right onto Jeanne Pruitt Dr. Take your first right onto 23rd St. N. Take your first left onto Jeanne Pruet Dr. Take your first right onto Plaza Drive and Northside Medical Associates is on your right. From AL 75 – Turn onto Gilbreath Drive directly from AL 75 (this is across from Oneonta High School, behind Alaco Pharmacy). St. Vincent’s Blount hospital will be approximately 0.2 miles on the right. Birmingham Heart Clinic is located on the main floor of the St. Vincent’s Blount POB in the Outpatient Clinic area. 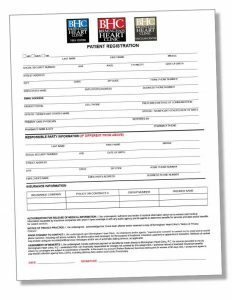 Download the form to your computer and either fill out the form and submit electronically or print the form and fill out manually. Any fields that do not apply please mark as NA.